Each prospective publisher has a similar (but not the same) requirements for a submission of unsolicited work. Some of the larger publishers like Dark Horse require a project to be well on its way before they will even look at a submission. Smaller, independent publishers have much less strict criteria, however, it is still important to project a clean, confident, professional package that wraps up a great story. The cliche is not to judge a book by its cover, but in comics, the cover is an important part of the whole. The tone is set by the art and style. 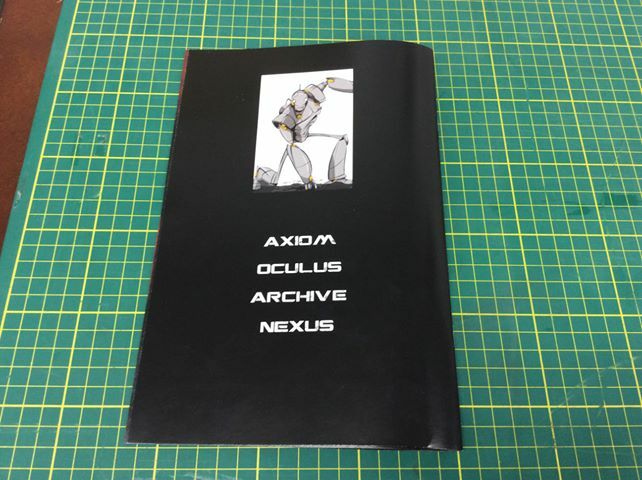 Many publishers will accept digital submissions via a web portal or email. Make sure to check the requirements for each publisher, and not to send a generic pile of information they did not ask for. It can make you seem unprofessional, and unable to follow instruction. Think of it as a job interview that you don't get to speak at. You have to let your submission package speak for you. 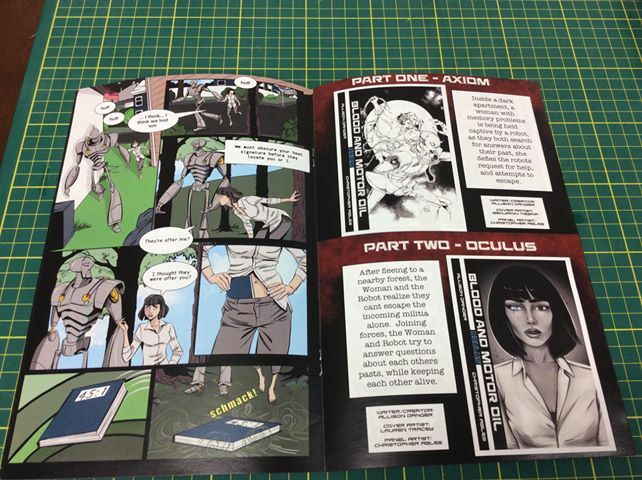 I opted to do a teaser comic and have it printed, but more than that, prepare a physical copy of the most strict and detailed publisher submission requirements so that while Im at Cons, and meeting people throughout the industry, I have something I can give them that houses all of the information, they as a publisher might want. 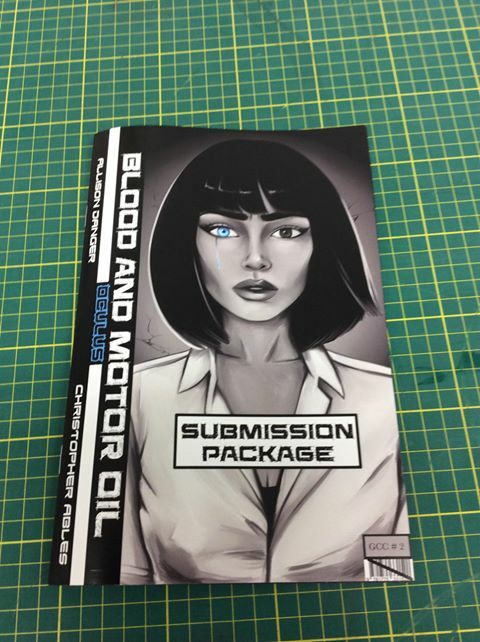 The unfortunate part is that the public won't be privy to these lovely little teaser comics, as they do contain the story of Blood and Motor Oil in full, in synopsis form. Don't forget that a publisher doesn't want a big reveal that they didn't sign up for. The entire story, with all the twists and turns needs to be laid out for them, so they know what kind of story they are putting their name to. At a North Ontario convention earlier this year, I met a lovely gent that not only owns a comic shop in a local (relatively speaking) city, but also has a print shop. 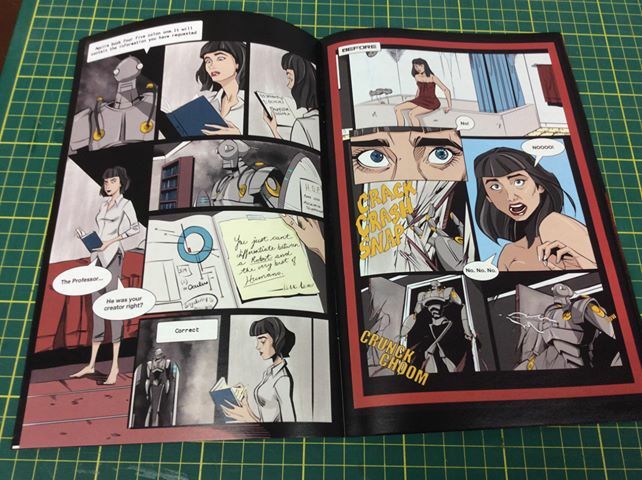 With an array of services to be sure, they do specialize in printing comics. Alfonso of Studio Comix has been lovely to work with, and has been able to put together (in record time) a beautiful package that I will have in hand at Tri City Super Con for October.